Lord Thornby has been trapped on his father’s isolated Yorkshire estate for a year. There are no bars or chains; he simply can’t leave. His sanity is starting to fray. When industrial magician John Blake arrives to investigate a case of witchcraft, he finds the peculiar, arrogant Thornby as alarming as he is attractive. John soon finds himself caught up in a dark fairytale, where all the rules of magic—and love—are changed. Well, Well, Well. This is a captivating (and a tad gruesome) read. Sign me up for immediate membership into Lee Welch’s fan club. I’ll patiently await my official VIP card, please and thank you. Lord Thornby is trapped on his father’s estate. Still. After being kept there somehow for well over a year, the days are bleeding together and he’s barely keeping a hold on his sanity. Thornby’s father and step-mother arrive back in town and there’s an increase in the already peculiar happenings taking place around the Yorkshire estate. Luckily, John Blake shows up to investigate some unexplainable magical happenings. 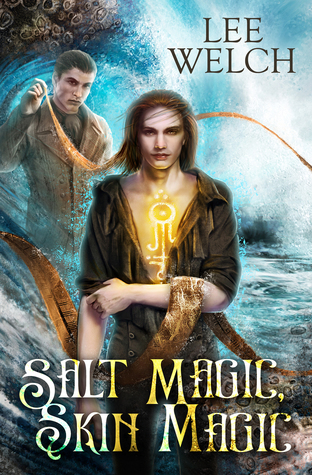 Salt Magic, Skin Magic is a historical paranormal romance that is very well done. I was enthralled from the very beginning and didn’t want to stop until the end. Once the plot picked up, I was on edge until the end. There are many PNR/fantasy elements taking place. Some of them made sense and other elements weren’t fully explained and left me wondering if it’s slightly lacking world building is setting up another book? I’d definitely read it. I wanted to give it more stars but I needed more at the end. There’s a HFN but where do they go from here? That could be me just being picky but I didn’t feel completely settled at the end. Still, very enjoyable and definitely recommend.